Mitch Jones has racked up a remarkable four home run titles over his 10-year professional career, but in 2009 he managed to do something he'd never done before. Jones' 35 dingers this season led not just the Pacific Coast League, but all of Minor League Baseball. 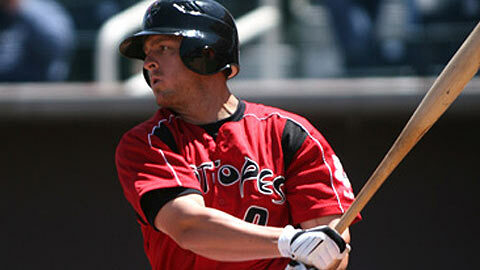 As such, the 31-year-old Albuquerque Isotope was named the winner of this year's Joe Bauman Home Run Award. The award, which is named in honor of one of the most prodigious hitters in the history of the Minor Leagues, will be presented to Jones at this year's Baseball Winter Meetings in Indianapolis. In addition, he will receive a check for $7,000 (representing $200 for each home run he hit during the season). Jon Gaston of the Lancaster JetHawks also bashed 35 homers this season, but in the event of a tie, the award goes to the player with the most RBIs. Jones was the victor in this category, driving in 103 runs compared to Gaston's 100. The Minor League home run race came down to the wire as Jones' 35th home run came in his last at-bat. On Sept. 7, the right fielder went yard in the fifth inning of Albuquerque's eventual 7-2 win over Iowa, and then was removed from the game as part of a double switch. Gaston played later that evening, but went 0-for-3 with a walk. "I've never been the type of guy who logs on the computer to see what others are doing," said Jones, when asked whether he was following the overall Minor League home run race. "If I had known, I probably wouldn't have hit that homer [in my last at-bat]. So it's nice that it worked out this way. Any time that you can go out there and do some stuff you haven't done before, it's a good thing." Perhaps the most impressive aspect of Jones' accomplishment was that he did so over just 108 games. Nonetheless, he passed the century mark in RBIs for the first time, and his home run total was second only to the 39 he hit while with Double-A Trenton in 2004. The Arizona State product was particularly fierce within the confines of Albuquerque's Isotopes Park, where he hit .358 with 23 homers and 67 RBIs over just 57 contests. "It's just a great place to play," said Jones. "There's a good atmosphere, because the fans really enjoy rooting for us. That can really help the players. ... I've been in other places where it wasn't nearly as fun to come to work." Jones entered 2009 with 200 Minor League home runs, the most of any player who had never appeared in a Major League game. (He was called up to the Yankees in 2006, but didn't receive any playing time). Despite the 35 he added to his total this season, this is a distinction Jones no longer holds. The Utah native was called up to the Dodgers on June 16, and he played in eight games before being designated for assignment on July 1 upon the return of Manny Ramirez. Jones hit .308 (4-for-13) during his brief big league stint, logging his first and only start against the Angels on June 19. "I wish it hadn't taken me as long as it did to get there, but it wasn't anything less than what I would have expected," Jones said. "I'd like to be back. I was hoping for a September callup, but that didn't work out. I'll just go out and get after it again next year."